Don't just hack and slash like a fresh recruit! Rise above the rank and file to become a true artist of combat with the secrets found within Pathfinder Player Companion: Weapon Master's Handbook! Emulate the fighting style of your patron deity, learn to use your weapons in tricky new ways, or simply enchant your boring old sword with new and exciting magical abilities. Whether you want to perfect the use of a single weapon, become an expert on a whole group of them, or dedicate yourself to a specific fighting style, this player-friendly volume contains everything you need! Weapon style feats giving characters focusing on one type of weapon or weapon combination new options unavailable to less specialized combatants. Advanced weapon mastery options that let specialized fighters continue to improve with their chosen weapons, even at higher levels. Magic item mastery, which pits a character's martial spirit against the essential nature of their magic items, resulting in radically different magic effects. 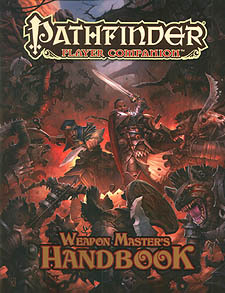 An expansion of the combat trick and stamina system introduced in Pathfinder RPG Pathfinder Unchained to cover combat feats from several Pathfinder Campaign Setting sourcebooks. A weapon design system that allows Game Masters to let their imaginations run wild, adding almost any conceivable weapon to their campaigns.